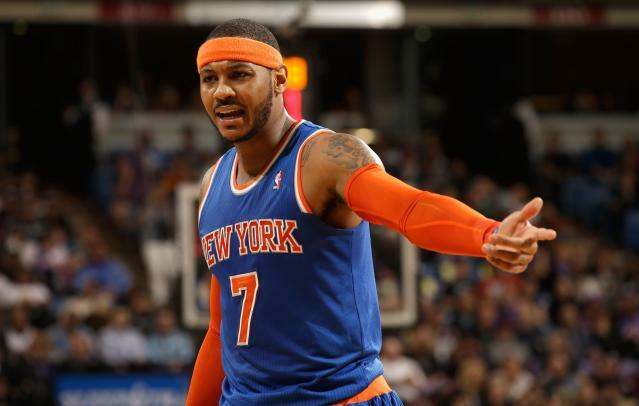 The Los Angeles Lakers have ascended into serious contention to sign New York free agent Carmelo Anthony, league sources told Yahoo Sports. The Lakers moved into strong consideration with the front-running New York Knicks and Chicago Bulls over this weekend, sources told Yahoo Sports. No one with direct knowledge of the process would declare the Lakers had overtaken New York and Chicago in Anthony's mind, but one source close to Anthony said of the Lakers, "They're in the game now." The Lakers met with Anthony on Friday, offering him a four-year, $97 million contract. Lakers star Kobe Bryant has been in constant contact with Anthony, and the Lakers could re-sign Pau Gasol to pair with Anthony on the frontline. The Lakers' roster is stripped of talent, and the combination of Bryant and Anthony possessing max contracts would limit the financial flexibility to upgrade the roster. Nevertheless, Anthony keeps a home in Los Angeles and the franchise's pitch has resonated with him. After Friday's meeting with Knicks president Phil Jackson and coach Derek Fisher, sources told Yahoo Sports that Anthony had become more comfortable with Jackson's plan to use him as the cornerstone to lure free agent stars into salary cap space in 2015 and '16. One thing that still bothers Anthony is Jackson had wanted him to take less than a max contract, sources told Yahoo Sports. Anthony, 30, is a seven-time NBA All-Star.